Indo-Parthian Kingdom at its maximum extent. The Indo-Parthian Kingdom was ruled by the Gondopharid dynasty and other rulers who were a group of ancient kings from Central Asia that ruled parts of present-day Afghanistan, Pakistan and northwestern India, during or slightly before the 1st century AD. 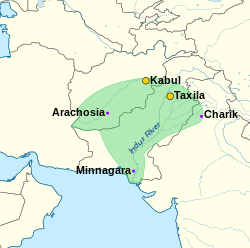 For most of their history, the leading Gondopharid kings held Taxila (in the present Punjab province of Pakistan) as their residence, but during their last few years of existence the capital shifted between Kabul and Peshawar. These kings have traditionally been referred to as Indo-Parthians, as their coinage was often inspired by the Arsacid dynasty, but they probably belonged to a wider groups of Iranian tribes who lived east of Parthia proper, and there is no evidence that all the kings who assumed the title Gondophares, which means ”Holder of Glory”, were even related. 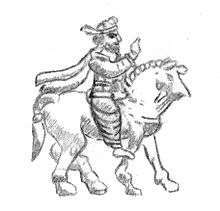 Gondophares I originally seems to have been a ruler of Seistan in what is today eastern Iran, probably a vassal or relative of the Apracarajas. Around 20–10 BCE, he made conquests in the former Indo-Scythian kingdom, perhaps after the death of the important ruler Azes. Gondophares became the ruler of areas comprising Arachosia, Seistan, Sindh, Punjab, and the Kabul valley, but it does not seem as though he held territory beyond eastern Punjab. Gondophares called himself "King of Kings", a Parthian title that in his case correctly reflects that the Indo-Parthian empire was only a loose framework: a number of smaller dynasts certainly maintained their positions during the Indo-Parthian period, likely in exchange for their recognition of Gondophares and his successors. These smaller dynasts included the Apracarajas themselves, and Indo-Scythian satraps such as Zeionises and Rajuvula, as well as anonymous Scythians who struck imitations of Azes coins. The Ksaharatas also held sway in Gujerat, perhaps just outside Gondophares' dominions. After the death of Gondophares I, the empire started to fragment. The name or title Gondophares was adapted by Sarpedones, who become Gondophares II and was possibly son of the first Gondophares. Even though he claimed to be the main ruler, Sarpedones’ rule was shaky and he issued a fragmented coinage in Sind, eastern Punjab and Arachosia in southern Afghanistan. The most important successor was Abdagases, Gondophares’ nephew, who ruled in Punjab and possibly in the homeland of Seistan. After a short reign, Sarpedones seems to have been succeeded by Orthagnes, who became Gondophares III Gadana. Orthagnes ruled mostly in Seistan and Arachosia, with Abdagases further east, during the first decades AD, and was briefly succeeded by his son Ubouzanes Coin. After 20 AD, a king named Sases, a nephew of the Apracaraja ruler Aspavarma, took over Abdagases’ territories and became Gondophares IV Sases. According to Senior, this is the Gondophares referred to in the Takht-i-Bahi inscription. There were other minor kings: Sanabares was an ephemeral usurper in Seistan, who called himself Great King of Kings, and there was also a second Abdagases Coin, a ruler named Agata in Sind, another ruler called Satavastres Coin, and an anonymous prince who claimed to be brother of the king Arsaces, in that case an actual member of the ruling dynasty in Parthia. But the Indo-Parthians never regained the position of Gondophares I, and from the middle of the 1st century AD the Kushans under Kujula Kadphises began absorbing the northern Indian part of the kingdom. The last king Pacores (perhaps before 100 AD) only ruled in Seistan and Kandahar. The city of Taxila is thought to have been a capital of the Indo-Parthians. Large strata were excavated by Sir John Marshall with a quantity of Parthian-style artifacts. 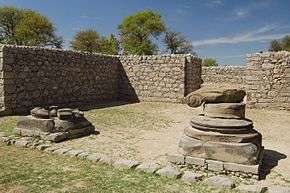 The nearby temple of Jandial is usually interpreted as a Zoroastrian fire temple from the period of the Indo-Parthians. Some ancient writing describe the presence of the Indo-Parthians in the area, such as the story of Saint Thomas the Apostle, who was recruited as a carpenter to serve at the court of king "Gudnaphar" (thought to be Gondophares) in India. The Acts of Thomas describes in chapter 17 Thomas' visit to king Gudnaphar in northern India; chapters 2 and 3 depict him as embarking on a sea voyage to India, thus connecting Thomas to the west coast of India. As Senior points out, this Gudnaphar has usually been identified with the first Gondophares, who has thus been dated after the advent of Christianity, but there is no evidence for this assumption, and Senior’s research shows that Gondophares I could be dated even before 1 AD. If the account is even historical, Saint Thomas may have encountered one of the later kings who bore the same title. 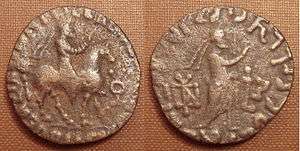 Gondophares on horse, from his coinage. He wears a short jacket and baggy trousers, rather typical of Parthian clothing. Portrait on Gondophares on one of his coins. "Tell me, O King, how you acquired such a command of the Greek tongue, and whence you derived all your philosophical attainments in this place?" [...]-"My father, after a Greek education, brought me to the sages at an age somewhat too early perhaps, for I was only twelve at the time, but they brought me up like their own son; for any that they admit knowing the Greek tongue they are especially fond of, because they consider that in virtue of the similarity of his disposition he already belongs to themselves." An inscription from Takht-i-Bahi bears two dates, one in the regnal year 26 of the Maharaja Guduvhara (again thought to be a Gondophares), and the year 103 of an unknown era. To the contrary of the Indo-Greeks or Indo-Scythians, there are no explicit records of Indo-Parthian rulers supporting Buddhism, such as religious dedications, inscriptions, or even legendary accounts. Also, although Indo-Parthian coins generally closely follow Greek numismatics, they never display the Buddhist triratna symbol (apart from the later Sases), nor do they ever use depictions of the elephant or the bull, possible religious symbols which were profusely used by their predecessors. They are thought to have retained Zoroastrianism, being of Iranian extraction themselves. This Iranian mythological system was inherited from them by the later Kushans who ruled from the Peshawar-Khyber-Pakhtunkhwa region of Pakistan. 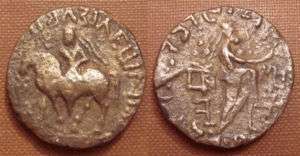 On their coins and in the art of Gandhara, Indo-Parthians are depicted with short crossover jackets and large baggy trousers, possibly supplemented by chap-like over-trousers. Their jackets are adorned with rows of decorative rings or medals. Their hair is usually bushy and contained with a headband, a practise largely adopted by the Parthians from the 1st century CE. Individuals in Indo-Parthian attire are sometimes shown as actors in Buddhist devotional scenes. It is usually considered that most of the excavations that were done at Sirkap near Taxila by John Marshall relate to Indo-Parthian layers, although more recent scholarship sometimes relates them to the Indo-Greeks instead. These archaeological researches provided a quantity of Hellenistic artifacts combined with elements of Buddhist worship (stupas). Some other temples, such as nearby Jandial may have been used as a Zoroastrian fire temple. The statues found at Sirkap in the late Scythian to Parthian level (level 2, 1–60 CE) suggest an already developed state of Gandharan art at the time or even before Parthian rule. A multiplicity of statues, ranging from Hellenistic gods, to various Gandharan lay devotees, are combined with what are thought as some of the early representations of the Buddha and Bodhisattvas. Today, it is still unclear when the Greco-Buddhist art of Gandhara exactly emerged, but the findings in Sirkap do indicate that this art was already highly developed before the advent of the Kushans. Numerous stone palettes found in Gandhara are considered as good representatives of Indo-Parthian art. These palettes combine Greek and Persian influences, together with a frontality in representations which is considered as characteristic of Parthian art. Such palettes have only been found in archaeological layers corresponding to Indo-Greek, Indo-Scythian and Indo-Parthian rule, and are essentially unknown the preceding Mauryan layers or the succeeding Kushan layers. Very often these palettes represent people in Greek dress in mythological scenes, but a few of them represent people in Parthian dress (head-bands over bushy hair, crossed-over jacket on a bare chest, jewelry, belt, baggy trousers). A palette from the Naprstek Museum in Prague shows an Indo-Parthian king seated crossed-legged on a large sofa, surrounded by two attendants also in Parthian dress. They are shown drinking and serving wine. Some pocket of Parthian rule remained in the East, even after the takeover by the Sassanids in 226. From the 2nd century several Central-Asian Buddhist missionaries became in the Chinese capital cities of Loyang and sometimes Nanjing, where they particularly distinguished themselves by their translation work. The first known translators of Buddhist texts into Chinese are actually Parthian missionaries, distinguished in Chinese by their Parthian surname "An", for "Anshi", "country of the Arsacids". An Shih Kao, was a Parthian prince, who made the first known translations of Hinayana Buddhist texts into Chinese (148–170). An Hsuan, was a Parthian merchant who became a monk in China 181 AD. Tan-ti (c. 254), a Parthian monk. An Fajin (281–306), a monk of Parthian origins. Coins of the Indo-Parthian king Abdagases, in which his clothing is clearly apparent. He wears baggy trousers, rather typical of Parthian clothing. 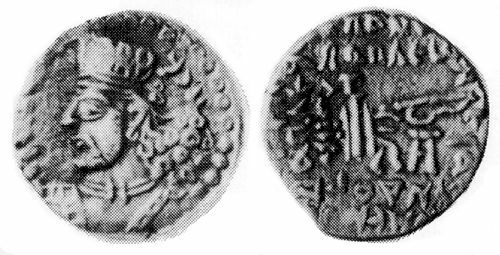 Coins of the Indo-Parthian king Abdagases, in which his clothing is clearly apparent. He wears baggy trousers and a crossover jacket. ↑ The chronology of the Gondopharid kings has long been uncertain, predominantly based on coins. This reconstruction is based on "Indo-Scythian Coins and History IV" by Robert Senior, CNG 2006, as the four volumes of Senior's work provide an almost complete catalogue of the coinage of the period. 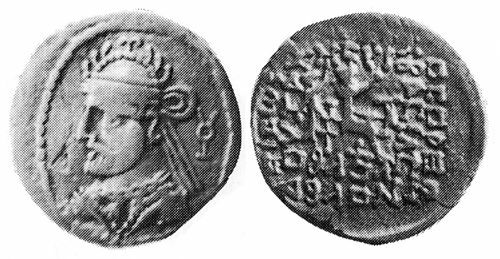 Senior's chronology is based on the existence of only one king Azes, a theory that was vindicated when it was shown that a coin of the so-called Azes II was overstruck with a type attributed to Azes I (see Senior, "The final nail in the coffin of Azes II", Journal of the Oriental Numismatic Society 197, 2008). ↑ A votive inscription of the 26th year of Gudavhara or Gondophares, is reported to have been found on a stone at Takht-i-Bahi, northeast of Peshawar with a date in the year 103 of an unspecified era reckoning. This era is likely to have been the Malva or Vikrama era, founded in 57 BCE, this would give a date of 20 CE for this king's ascension (see Hindu calendar). The stone was formerly in the museum at Lahore. The point is especially important for those Christians who consider that a germ of history is embedded in the Acts of Thomas. ↑ Pacores is not dated by Senior in Indo-Scythian Coins and History, but as Senior’s chronology is generally antedates the Indo-Parthian kings by a few decades, it follows that Pacores is probably also earlier than the date 100-130 AD, that was previously suggested. ↑ see Senior, "The final nail in the coffin of Azes II". 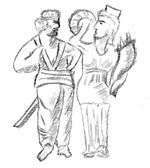 Wikimedia Commons has media related to Indo-Parthian.